What's up with prominent users editing blatantly off topic posts? This is in reference to the two posts made by an user yesterday which were heavily downvoted for being blatantly off topic. However, I noticed some users editing those topics when they ought to be deleted. And the last one was just a picture with the bold claim of having found middle Earth and nothing else and someone still decided to the do the same adding a few spaces to random words; Did I find Middle Earth? Since your question is specifically about "blatantly off-topic posts", I'll restrict this answer to the context where the questions are clearly off-topic and none of the users involved want to reopen them. Questions which are off-topic should usually end up deleted, and in many cases will be automatically deleted by the system after some time without need for user intervention. So there's no point in prettifying or improving something that's going to disappear off the site anyway. Especially minor edits like adding spaces, which one would usually expect as a touch to add perfection to an already good post - but even tag edits don't matter for posts that will end up deleted, as they won't appear in the tag lists. ... but there's usually no harm in it either. I'm not sure why you seem so indignant about this. It is strange behaviour, true, but it doesn't really harm you or anyone else. As mentioned above, it could be badge chasing - and this site does have a (minor) broader problem with people making pointless edits - but less harmful to the site than other forms of badge chasing I've seen. The main harm I can think of in editing blatantly off-topic questions is that it might kick them into the Reopen Votes review queue, thus wasting reviewers' time on a review that should never have existed. This would only happen if the question is edited after being closed. So if we want a general guideline out of this, I'd say don't bother editing questions which are (a) closed and will clearly never be reopened or recovered, and (b) on their way to deletion, either by user votes or roomba. If the question is arguably on-topic and might be reopened, or if it has answers and therefore might stay on the site, then feel free to go ahead and edit it just like any other question. Abbreviations reminder, just in case: DV = downvote, VTC/VTD = vote to close/delete, LQP = low quality posts. First, as Kevin pointed out in a comment, there are a couple of reasons to edit off-topic questions. Removing or fixing bad tags. In case the post later gets edited in an on-topic, non-dupe question, the tags will already be sorted out. It's a good thing. Plus, people watching said tags might be more likely to eyeball the question and provide guidance on how to reword it into a good post. Removing personal information (e.g. "Please email me the answer at somebody@example.com"). That one doesn't need any explanation, although IMO, if you're going to edit out personal information, I'd say to also flag it for a mod to mod-delete the mail/phone number/etc out of the revision history; they have a tool for that. They did not agree with you that the questions were blatantly off-topic, and felt they might be salvageable. Do the makers of Jumanji: Welcome to the Jungle consider the film to be science fiction or fantasy? went from an off-topic "Is X considered science-fiction?" to an answerable, definitely non-POB "Have the writers stated..." question, thanks to an edit. Show from the 80s about ghosts was apparently two questions in one, was downvoted like crazy (and rightly so); someone edited out the second story-ID question, making it a non-too-broad question, and a couple of DVs were reverted (at least I think I remember so). Fixing severe formatting problems that made the questions difficult to read (so that other high-rep users could more easily see their off-topicness). That's also a fair point, not much to add here. Now about the three specific ones from yesterday. 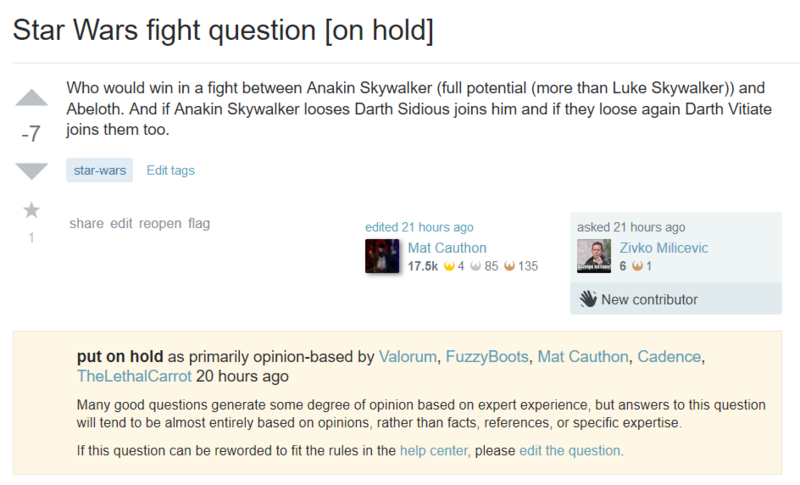 The timeline of "Star Wars fight question" shows that the edit was made through LQP review queue. It's not obvious, but editing through the review queues kicks the post off said queue (per main Meta). It's not obvious, because in Low Quality Review, you're faced with 4 buttons: Looks Ok, Edit, Close (on questions)/Delete (on answers), Skip. 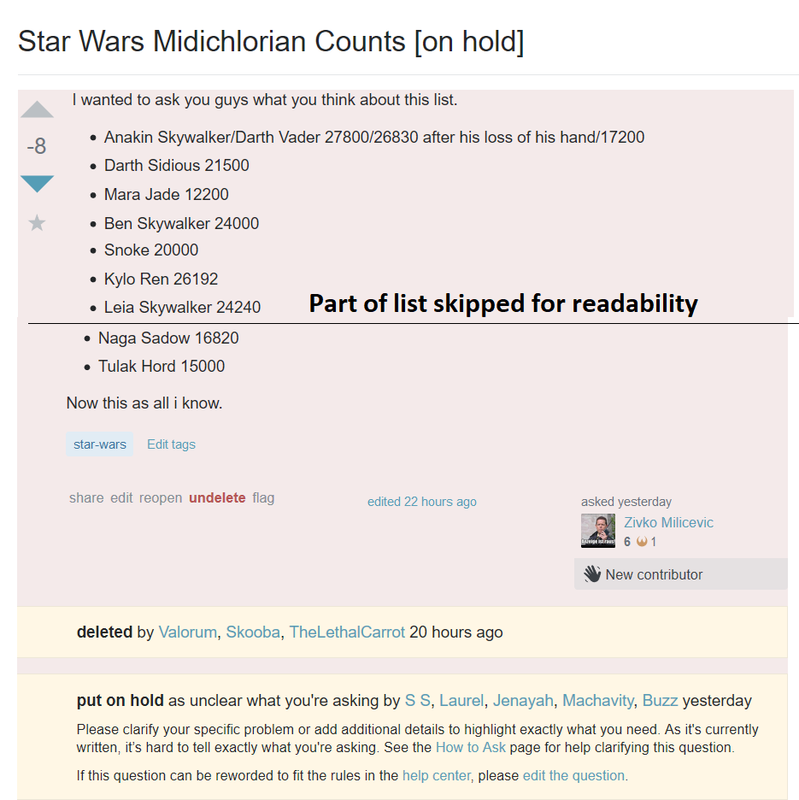 The edit made the question go from "unreadable block of text" to "readable off-topic list" (compare). Is the question still off-topic? Very definitely so. Is it clearer why? Kinda. The block of text screams "unclear" before it screams "off-topic", but a post that opens with "What do you guys think of my list" is explictly a no-no per the Help Center's "Don't Ask" ("there is no actual problem to be solved: “I’m curious if other people feel like I do.”"). It's not the greatest edit you'll find in this site, but at least it doesn't disturb the homepage as the question scored below -4 (and thus is only bumped in the "active" tab, not on the homepage). Did I find Middle Earth? The edit (screenshot) fixed a bit of formatting and added the j-r-r-tolkien tag. Once again, it's not the most useful edit in the history of SFF, but a j-r-r-tolkien watcher might be able to provide more guidance (see point 4. above) or actually understand what is going on here. 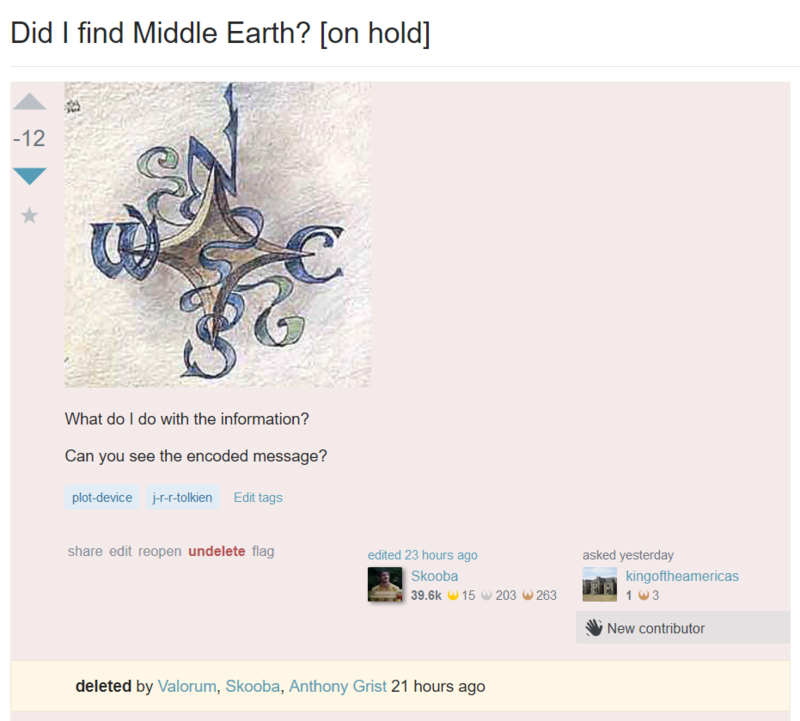 The question was deleted shortly afterwards, though. Of course, it can happen that one has just woken up/is on their phone/just isn't giving it much attention, so they go for an edit instead of VTCing/VTDing first. Happens, fortunately we have a good base of other users who moderate the site and take care of the matter. Sometimes people can also think twice and VTC/VTD something they didn't deem worthy of before. Coincidentally, it happens that when an "on hold"/freshly dupe-closed question is edited, it automatically gets sent to the Reopen review queue, where anyone over 3k rep can vote to Reopen or Leave Closed. That includes the one who edited, unlike, for instance, VLQ posts that you can't review if you previously cast a VLQ flag on them. As long as the edit somehow helps the post with regards to 1+ of the 4 points above... It kind of helps, even if by a long stretch, so, alright, I guess. However, in my only-commits-me opinion, when you're going to edit off-topic questions with a very minor edit, and then cash in a Leave Closed vote (progress towards Reviewer/Steward badges...), and then vote to delete it right after that, repeatedly, perhaps the "Delete" button is the first one you should have pressed. Just saying. In short, there's usually no downside to such edits. Most of these types of edits come shortly after the question has been posted. 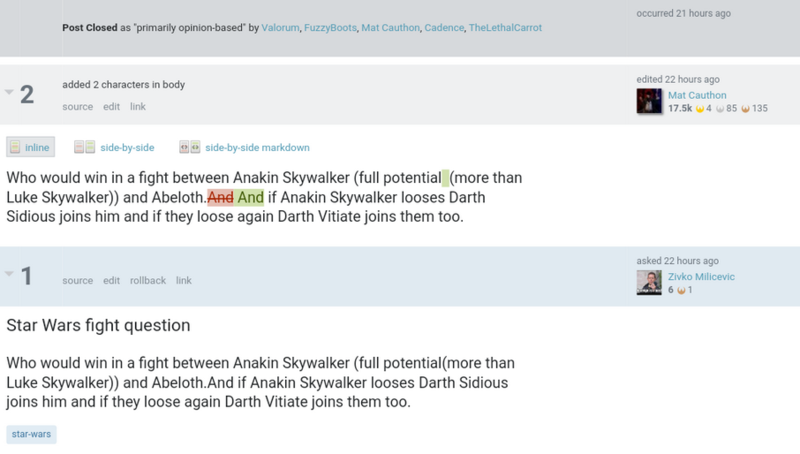 The edits are not bumping bad posts to the top of the homepage, because the posts are already at the top of the page. Such edits would only have a downside if they were done in a way which sent the post out of the Close Queue or into the Reopen Queue. The latter is less likely to happen because that means the question has already been closed. The former would only happen, as Jenayah explained, if someone edited the question from the queue without realizing that that is the equivalent of a Leave Open vote. Additionally, even if it does happen it is not much effort for people to quickly review a question again and vote to Leave Closed, and if it was kicked out of the Close Queue it will probably still be seen by enough users to close/delete it. The upside of such edits, however, is fairly reasonable. It is always better for a post to be better written and formatted. 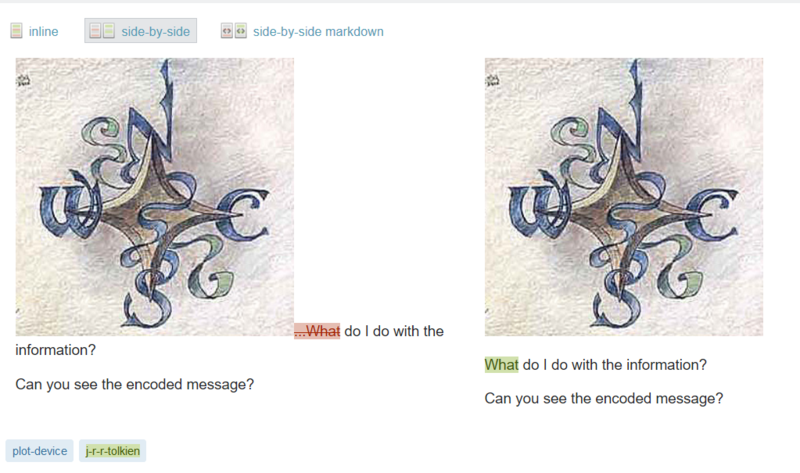 Even if a question is on its way to being closed/deleted it can still benefit from editorial improvements. We don't want poorly written posts sitting around until they get deleted. A well-written but off-topic question looks much better than a poorly written off-topic question. In short, I would assume that some people make these kinds of edits because they feel that the benefits outweigh the risks. Another important point is that one person's "obviously off-topic" is another person's "perfectly fine question". And the same for other close reasons. There is often quite a bit of dispute about question closures. So even if you think that a question should clearly be closed and deleted, it is quite possible that other users disagree. From their perspective they are simply editing legitimate questions. This site is for discussion about Science Fiction & Fantasy Stack Exchange. You must have an account there to participate. Is a promotional grant for Star Wars: The Complete Saga on Blu-Ray wanted? Are references to other questions in question introductions ok? What type of questions bring in the most viewers? Was I “not very nice”? Are users allowed to add information when editing a Story-Identification question? Possible bias shown by high-rep moderators on a particular post?